African scholar and, perhaps, liturgical poet; of unknown date. He collected the poems of Judah ha-Levi into a diwan, providing the volume with an Arabic introduction and heading most of the poems with superscriptions in which both the contents and the occasion of each poem are indicated. In the introduction, which was translated into German by Geiger ("Nachgelassene Schriften," iii. 154), Yeshu'ah says that he utilized three collections of his predecessors, Ḥiyya al-Ma'arabi, David b. Maimon, and Abu Sa'id ibn Alḳash; but he added many more poems, for which he does not guarantee Judah's authorship. 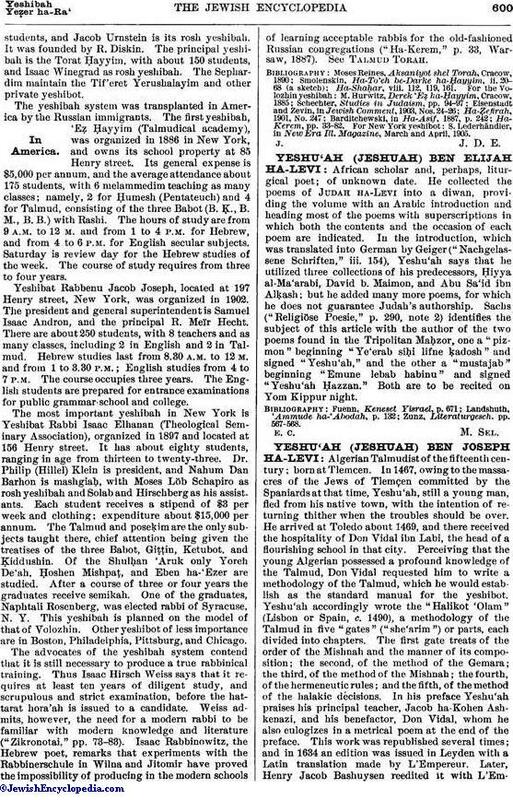 Sachs ("Religiöse Poesie," p. 290, note 2) identifies the subject of this article with the author of the two poems found in the Tripolitan Maḥzor, one a "pizmon" beginning "Ye'erab siḥi lifne ḳadosh" and signed "Yeshu'ah," and the other a "mustajab" beginning "Emune lebab habinu" and signed "Yeshu'ah Ḥazzan." Both are to be recited on Yom Kippur night.